A: My book is in the career development space, but I referenced my years as technology marketing executive to apply my researched concepts to careers, particularly marketing careers. 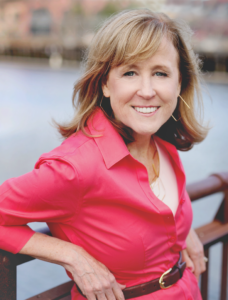 Several of the people highlighted in the book’s case studies are marketers. 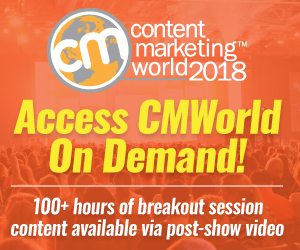 Advice: Create dynamic case studies, including creative brief, swipe files, plan, goals, and detailed list of specs and requirements of your marketing projects, campaigns, and programs. Why? So you can experiment, make mid-course adjustments, and learn from your successes and failures via team debrief. 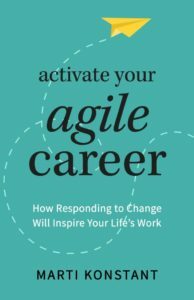 Q: What was the inspiration for activate your agile career? What if we could apply these responsive methods to the management of individual careers, leading to a flexible framework, rather than a rigid one (often filled with frustration and unhappiness)? I imagined a framework addressing the optimization of what’s most important to people, like creativity, growth, and happiness. Of course, the topic was begging for research. 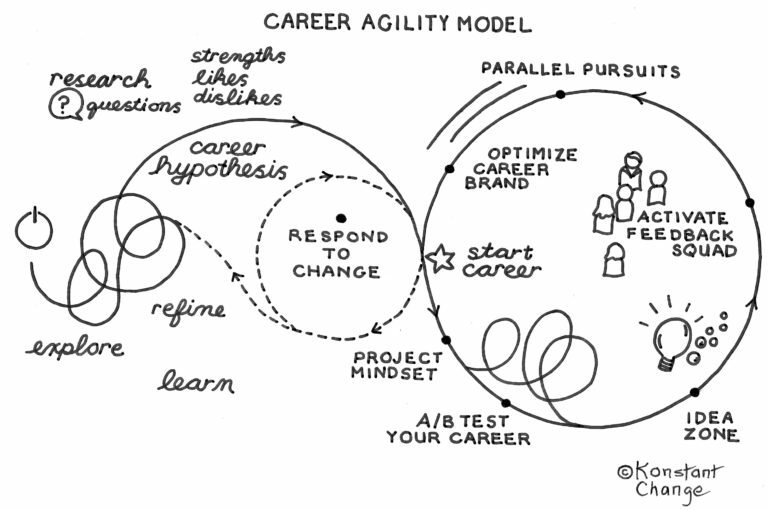 That’s when I launched the Agile Careerist Project. The bridge to inspiration: my work on a global team of marketers at Sprint Zero, (June 11, 2012) who created an agile marketing manifesto, a set of values and principles for marketers to apply to marketing methods and processes. The goal was to leverage the benefits of agile software development in the marketing world. Influenced by primary research with global workers and participation in agile methods across the software and marketing professions, I define the agile career. When studying career agility, I observed the shared traits of the nimble employee and flexible entrepreneur. These self-directed individuals operate in multiple lanes, not single lane careers. They show an uncanny ability to adapt to setbacks and uncertainty. They are, like the synonyms of “agile,” buoyant, energetic, limber, lively, quick, rapid, and sharp. Using curiosity as my guide, I conducted 120 cross-generational research interviews. Wanting to know more, I collaborated with a research team to administer a worker survey. We wanted to know why some people anticipate their next moves, while others remain steadfast in their work roles. We learned how individuals respond to change and how they make career navigation decisions. 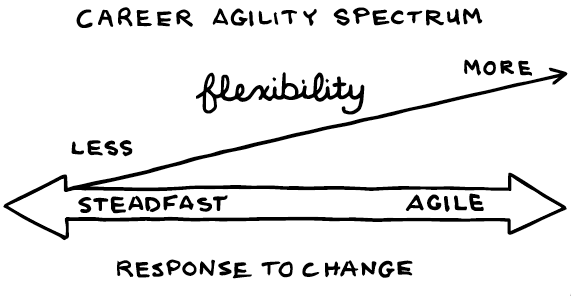 People fall on a spectrum between a steadfast careerist and an agile careerist. Steadfast individuals are less flexible and less responsive to change. A: I want people to become the directors of their own careers, rather than letting a boss, a colleague, or expectations of others steer the ship. My goals is to help individuals remain relevant in the workplace by responding to change with an agile mindset, rather than ignoring technology, economic, or financial trends. I want to inspire people to tackle the fear in front of them, rather than attempt to delay the inevitable. A: I am a career growth analyst and workplace futurist with an agile mindset. I research, write, and speak about career agility. Through a series of workshops, guides, and courses, I help global workers and the people who hire them respond to change in the workplace. Q: What are the books that inspired your work/career? Idea: How to recognize and act on the obvious dangers we ignore. 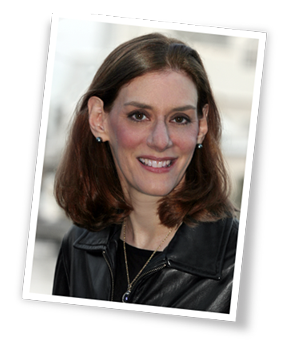 She highlights the abundant early warnings preceding economic, environmental, and economic crisis situations. The Global Financial Crisis, a catastrophic bridge collapse, the failure of an industry like Kodak are examples. She states a Gray Rhino is a highly probable, high impact threat; something we ought to see coming, like a two-ton rhinoceros aiming its horn in our direction and preparing to charge. She wonders why humans avoid change, freeze rather than act, and kick the can down the road, and bargain. Anything to deny the danger ahead. Influence: My hypothesis and case study examples point out that an “adapt and respond to change” strategy is an effective way to manage careers where the individual can direct his/her own future. No need to let things happen, when you can respond to trends and make decisions to benefit the individual. Q: What is the biggest challenge that you’ve had to overcome in your life or career? A: When I was 32, I went through a divorce where everything I believed in re: family, trust, love, financial stability, and my career path were shattered. They ceased to exist. Up until that point, my life seemed ideal with a progression of life’s milestones. Emphasis on “seemed” as there were red flags and a few gray rhinos in my view. I started over after a nine-year relationship, closed my marketing business, and moved from the suburbs to the city with minimal funds. I did not know anyone and haphazardly reinvented my life and career. A: I have a hopeless passion for typographic exploration. When I read about Steve Jobs fascination with type and how it impacted his view of computers and visual display, I was intrigued. When I travel, I often view the world through the filter of signs and unique typography combinations. The foreign language makes it all the more exotic. During my book development, I reconnected with my type and illustration ways by designing and developing all of the images, something I had left behind when I was 24. Once I started marketing roles, I never looked back and felt hand lettering and illustration were for artists. I learned once again I am an artist. A: In preparation for my book launch and to reinforce my “Becoming KNOWN” strategy (thanks Mark Schaefer), I launched an Instagram channel that focuses on Career Agilty three months ago. The result is a branded channel called @AgilityThink that serves as a photographic image and micro-blog for the topic. Sample posts. The tips, musings, and creative thought are included within each post here. within Instagram. Check out the musings – it is short and fun! A: Thought: Regis McKenna. Marketing is everything. Everything is marketing. More true now than ever before. You know that question so many people ask in a crowded room when presenting, “How many people here are in sales?” When only three people raise their hands, the presenter says, “You are all in sales.” Old and tired question, but so true. Well, in the age of personal branding, we are all marketers. Thank goodness I was a marketer from the start. You can’t take the marketing out of the girl!